The Axle Protective Guard made of high quality material is specially designed and manufactured for 1/10 Traxxas TRX-4 E-REVO RC Crawler Car to enjoy DIY delight. 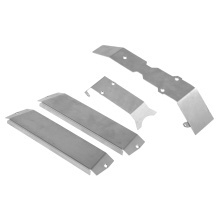 It is used to protect your frame, chassis and front/rear axles. If you are DIY hobbyist, it is what exactly you need, what are you waiting for?